I have spent a fortune on buying fonts that I feel will add value to my work, I have no problem with investing good money in this way. After all, fonts are generally the foundations of a logo, makes sense that you place value on an aspect of your job that without, would be all but impossible to do. This is why I have the utmost respect for typedesigners, this is a skill beyond just being creative. When I am working on a new logo project and see a new commercial font that would be perfect, I will buy it, no questions asked. And yes, a medal would be nice. Commercial fonts have licences of course, they are not without limitations, but they are for the most part, more than reasonable. I guess a reasonable comparison would be musicians and royalties. There are a scenarios where ‘non-comercial use’ is valid, like a beta font for a possible new commercial font. I can understand the reasoning here, and usually there is a detailed description of ‘why’ accompanying the font. The other one is where there is family of weights for example, one weight (with limited character set) might be made free for the purposes of testing, allowing the user to try before they buy. This expands on the limited type testers usually now found on type foundry websites etc. Great, so that tackles commercial fonts. The main point of this post is to try and understand the non-logic behind the restrictions that some free fonts have time to time. I’m not talking about the awful variety usually associated with free font sites, I’m talking about fonts like the stunning Franchise Font by Derek Weathersbee or the equally stunning The Lobster Font. Fonts where the designer has clearly put their heart and soul into the design and creation of something that will be of value to other designers. Derek makes no demands, other than presenting a few marketing ploys to bolster the distribution of his work, like making a small donation or buying a t-shirt, all VERY reasonable under the circumstances. In fact he goes the other way, he makes it very clear that if you do use his free font for commercial or non commercial use, that you send him examples of it… this is what makes it all worthwhile. Seeing your work being used by someone else for someone else. What confuses me is when I come across what looks like a lovely free font. First impressions are really positive, the accompanying gallery images make the font look like a real winner, but then you see the ‘No-Commerical Use‘ line. 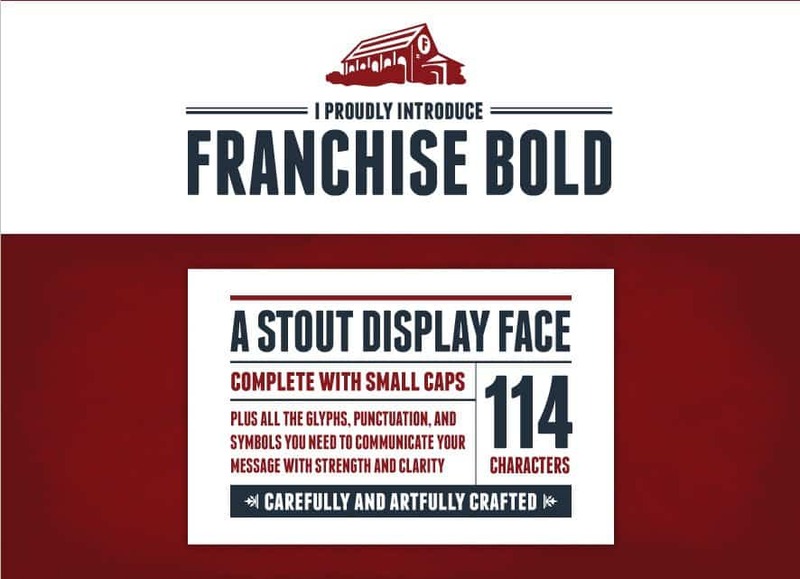 So you have spent all this time and energy, crafting a wonderful new font, going to the trouble of creating supporting imagery to presumably help promote the font, but then specify that we can’t use it for commercial use. What is the logic behind this move? If you don’t want people, other designers, profiting from your work then why make it free in the first place. If you are that sure/presumptuous other designers would want to use the font for commercial use, then charge for it, but don’t presume people would want to use it for commercial use, but take away that option. It really makes no sense and makes you look a little odd to be honest. Or do you forever want your creative creation always assciated with Church flyers and birthday parties? Either make it free with no restrictions like Derek, or make it a commercial purchase or even a trial (limited character set) font. I do understand the logic of not wanting other’s to profit from your work if you have not got anything from it yourself, especially if these other people have copied your work or other less honest means. People like Derek are clearly proud of their achievements, without having some control type issue over it and want to literally, spread the love. This has a greater accumulative affect on the marketing of that font and consequently your own image and profile. This is what you should be focusing on. What goes round generally comes round. I guess some people say we should be appreciative that someone has created something for free in the first place, regardless of the conditions tied in with it, I disagree with that logic when it is associated with design work. If I see a font that is free but that I can’t use for commercial use, it really isn’t much use to me, unless I am designing party invites or playing with concept work, which I avoid like the plague. So ok, the latter point, concept work is important for a designer, so yeah sure, downloading a cool free font that helps you here is awesome. However, this is also flawed logic. By helping people with their concept work, which by itself is non-commerical, you are actually helping them create a reputation that will surely make rich and famous. So regardless, you are helping someone financially, it’s not just as quick. It’s just short sightedness on your part. By imposing restrictions you are reducing the potential impact and reach of your work. Not so many people will download it, not so many people will see it, not so many people will hear of you or see the work you can do. By imposing restrictions you are missing out on helping designers with their paid work, the work that pays their bills. So we go back to the point that you have a grump about people profiting from something you have previously made available for free, or you have control issues. Neither are helpful and wise to really promote or have associated with your name, people like me get grumpy about things like this. Its like one big tease, just not useful in the greater scheme of things. Hooking people in to your website with the promise of a free font should extend to making it totally free to use. If you are giving something away for free, then make it totally free and without condition. If you really can’t bear the thought of 100’s of other designers profiting from your work, then don’t make it free, charge for it. If it’s that good, people will pay the money. You will receive respect and plaudits for your skill and business prowess.